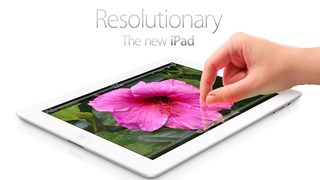 Apple will release a new version of the iPad on March 16, it said today at a press conference in San Francisco. Our sister site Gizmodo has all sorts of details on the new tablet, which will use Apple's high-definition Retina Display and feature 2048x1536 resolution. It will be available in black and white, starting at $499 for the 16 gigabyte model. The 32 gigabyte model will retail for $599 and the 64 gigabyte model will be $699. It will run for $629, $729, and $829 with 4G Internet connectivity. Epic Games President Mike Capps took the stage to announce Infinity Blade: Dungeons, a new game in the mobile series. He said the new iPad has more memory and a higher resolution than the Xbox 360 and PlayStation 3 gaming consoles. Publisher Namco Bandai showed off a flight simulator called Sky Gamblers on the new iPad, which it called "console-quality." Apple CEO Tim Cook called the new device a "graphics powerhouse," saying it will be four times as powerful as the last iPad, according to GDGT. It will use an A5X quad-core processor. The new iPad boasts 10 hours of battery life, and 9 hours while using 4G. Apple says it sold 15.4 million iPads in the last quarter alone.